At the end of last year, on the 20th of December, Destination Maternity (NASDAQ:DEST) and Orchestra Prémaman (EPA:KAZI) announced that they had entered in a definitive merger agreement in which Orchestra Prémaman would acquire Destination Maternity in an all stock deal. Destination Maternity shareholders are going to get 0.515 Orchestra Prémaman shares in the form of ADSs that will be listed in the US and will own 28% of the combined company after completion of the transaction. The consideration represented a 34% premium at the time of the announcement, and since it’s a deal between two relative small companies with no regulatory or financing risk you wouldn’t expect a huge merger spread. This couldn’t be farther from the truth than possible though. 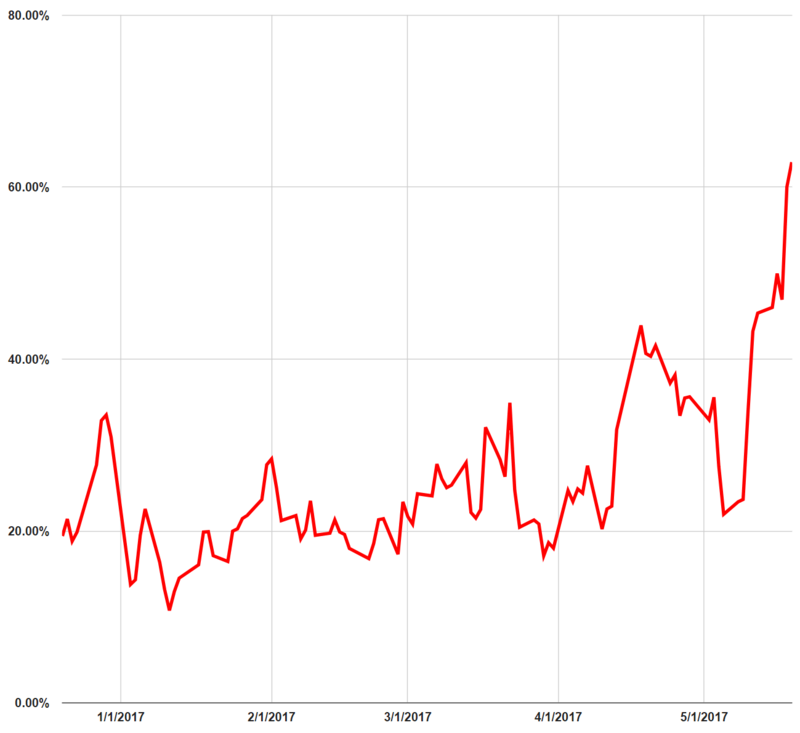 Ever since the deal was announced the spread has bounced around 20% (although sometimes spiking down or up significantly), and in the past week the spread has exploded to a totally ridiculous 63%. This week the spread has come down a bit again, but is with 36% still offering an extremely compelling opportunity in my opinion. I wrote an article about it on Seeking Alpha that after a 24 hour embargo is now accessible for everybody. You can find it here. This entry was posted in Portfolio and tagged DEST, KAZI.PA on May 24, 2017 by Alpha Vulture. Hey AV, thanks for the post. Great work as always. Just trying to figure out the mechanics of SA Pro (in light of the significant narrowing of the spread since your post), did you post this on SA Pro on the 23rd of May? Only just discovered your blog, but it’s amazing, thanks! 1. It’s now been nearly 6 months and DEST has still not published their proxy. 2. I have no interest staying long maternity retail for months on end, so I’d have to short Orchestra. But the borrow rate for Orchestra Premaman is somethign like 8-10%. Are you hedging? I guess not. I think I’ll probably wait for the proxy to come out, there should be some spread left. May I know how you calculate the spread premium? Based on my calculations, I can’t seem to get 60% spread. The highest I can get is 51%. I am using (0.515 X KAZI Price – DEST Price) / DEST Price. Am I calculating it correctly? Dont’ forget to add the EUR/USD FX rate. I like this idea and I also like to add a little good, specialist, nichy retail exposure. 1% of portfolio alocated to this trade. Thanks for sharing AV! Do you think the deal itself is imperiled at this point? A fat spread has reemerged for any new arbs looking to enter. Are you comfortable with the risk of holding unhedged Orchestra stock, even for a couple of months, given its balance sheet, history of wild stock price fluctuations and now deteriorating operating performance? Orchestra already only has 31.6% of float, now DEST shareholders will get 25% of the combined company, many of whom will be arbitrageurs. Wouldn’t a lot of them be running for the exits at the same time when the deal closes? Besides the now deteriorating operating performance nothing has really changed IMO, so yes those risks where there and are still there. Do you still hold your position then alpha? In the rearview mirror.. Is it likely DEST was being used as the means with which to short KAZI? It was certainly easier to borrow. I still like the spread. No. There is almost no short interest in DEST. If you add back the accelerated depreciation and the one time exceptional loss which was a gain of the same magnitude last year, the results are a minor profit… So maybe a 30% drop was a bit extreme? That was my thought. A cursory view of KAZI report did not indicate a permanent decline in earnings power. Retail is tough to value but with modest assumptions and multiples, I would say that the combined entity is worth between 7-9 Eur per share. Given the current FX rate and conversion ratio this is a minimum value of 4 and change USD for every DEST share and likely quite a bit more, making this a nice prospect for new arbs to enter or for old arbs to add to. The problem is that there is a serious psychological hurdle to adding to a position that has already caused people a lot of pain. My main concern is that DEST shareholders will vote the deal down in light of the news from KAZI. This outcome is even more likely given that I think alot of arbs exited their positions out of sheer disgust yesterday. It’s also possible that DEST shareholders will demand some sweetener if the deal hopes to pass but that’s mere speculation. Investing is a probablistic exercise and process is more important than outcome. With a sound process the outcome will occur given enough time so long as you stick to your principles. I believe the process was sound in this case and there’s a good shot it will still work out in our favor. Thanks for the continued hard work alpha vulture. I don’t think DEST is an financial shape to have a strong negotiating hand at this point. Orchestra is awfully close to failing the leverage ratio covenant isn’t it? With the additional debt of DEST, this can’t be a comfortable situation. Are saying that’s what the covenant will be or the ratio? I think the current covenant is 3.0x net debt/EBITDA. So if you’re saying 3.5 is the forward ratio, then they might get screwed by creditors. I just redid it more carefully and my 3.5x figure was based on the debt before KAZI’s most recent regorganization (per the recent communication). It looks like the ratio will be closer to 2.5, assuming that EBITDA margins stabilize. My apologies for causing you any unnecessary stress. If the current covenant is 3x we should be fine on that front. The lack of interest coverage, however, is still really bad. Harry, do you know if the covenants are for the bank debt or for their bonds? I am trying to understand what to do with this trade, because the combined entity now looks relatively cheap. But, psychologically, if you are a DEST shareholder you may now feel very bad in taking this deal. Does anyone know what majority is required in the EGM of DEST to pass the merger? I believe that KAZI has a good chunk of shares ( I remember 13% but I am not sure). AV. Still in the position? Any new thoughts? Stampede for the exit. Expensive tuition on my first merger arb. Hi AV, still holding on to DEST or did you take the pain? I don’t think it’s very relevant if I still have a position or not.